Derrick, Tiffany, and their two children were all born and raised in Hawaii. Prior to moving to Virginia, Derrick was a teacher by trade with a long history of working in the hospitality industry and a passion for cooking. 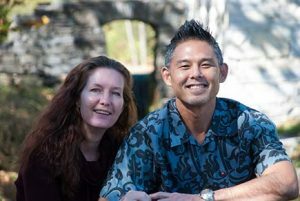 Tiffany was a practicing physician in Hawaii for 16 years, specializing in teaching mindfulness and wellness programs to individuals, community groups and corporations. As a family, we were looking for a way to all work and play together and experience more of the world. We scoured the internet and then visited inns across the country, from Washington State to Washington DC looking for the perfect fit for us. We knew the moment we drove onto the property, in April of 2015, The Inn at Vaucluse Spring was perfect. This was the place for us to start a brand new adventure together. We were mesmerized not only by the peaceful setting, abundant spring, and history, but also by the people that grace this place. We strive to provide warm hospitality with that special Aloha spirit, along with excellence in service and attention to detail. Our vision is to offer our guests an unique and authentic experience outside of the hectic lifestyles we tend to lead these days, so that everyone leaves feeling nurtured, refreshed and rejuvenated.